Jessica and John struggle with her maternal instincts in Chapter 5. She wants a second child. He’s not so sure. Is the post-ice-cap world a fit place for children? Like you, I want a normal life. 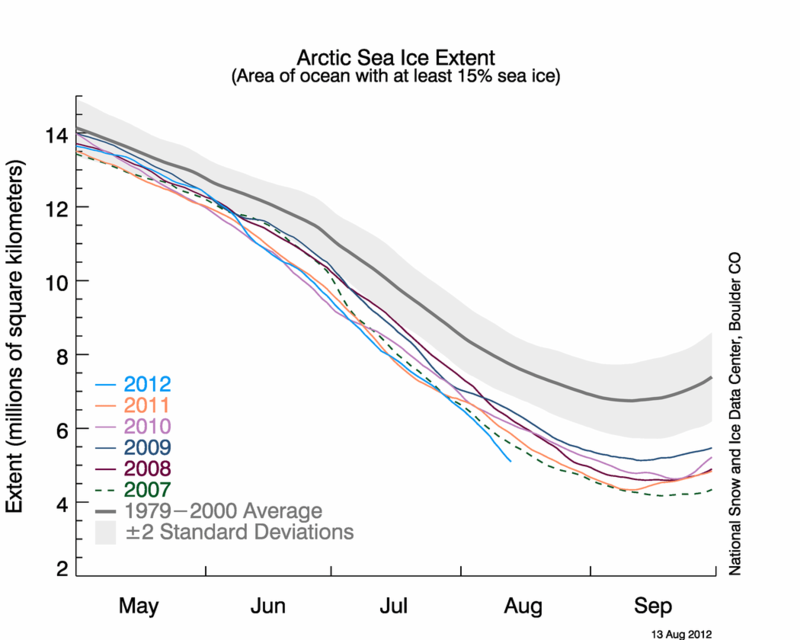 But the very concept of “normal” is part of the cultural and psychological inertia that keeps us from heading off the climate catastrophe that is even now unfolding, pushed that much closer by this year’s record low Arctic sea ice extent. Normal is the world we’re born into. It’s a cultural context. What’s normal in our lifetime is not normal in the context of earlier times. If you could go back to 1902, the year before the Wright Brothers flew at Kitty Hawk, and could put your great-grandmother in an upholstered aluminum tube to launch her through the atmosphere at 550 miles an hour, she would hardly regard that as normal. But in 2012, stepping into an airplane and emerging a few hours later a continent away is one more economically foundational, climate-eroding act we’re entitled to engage in at will. In the context of geological time, jet flight is aberrant in the extreme. I’ve developed a new respect for the old codgers who declared man wasn’t meant to fly. Their instincts were telling them something. It is most literally an unnatural act. Our “normal” life of fossil-fueled prosperity is about to change, one way or the other. With a lot of agreement and coordinated effort, we can phase over to a new normal that bears some resemblance to the way of life we now cherish. But if the ice cap disappears soon, and the Arctic inverts from heat reflector to heat collector, normal will invert, too, and it’ll resemble a smash-up of the Black Death, Mad Max, and Nineteen Eighty-Four. We really have a hard time imagining this could be true. It’s almost like thinking that the California coast is going to collide with the Aleutian Islands within our lifetime. Such profound changes should be so slow as to be imperceptible. But the graph above says otherwise, and to manage our way to a new normal, imagine it we must. An even deeper challenge, perhaps, is to imagine a new normal that is attractive and something to aspire to. I’m up for a world that’s less consumerist, less dominated by trans-national corporations with their cynical manipulations of patriotism, and more local, with happiness as the primary measure of well-being rather than rank material wealth. PS: The ice cap is suddenly getting a lot of attention. As I was writing this post, a great article from Climate Progress popped up which validates everything I’ve intuited about the consequences of a disappearing ice cap—the premise of my cautionary dystopian story, A Change in the Weather.